There are only a few days left until Halloween, so time to whip up those last minute crafts! I love simple projects and using nothing more than a sheet of paper is about as simple as it can get! 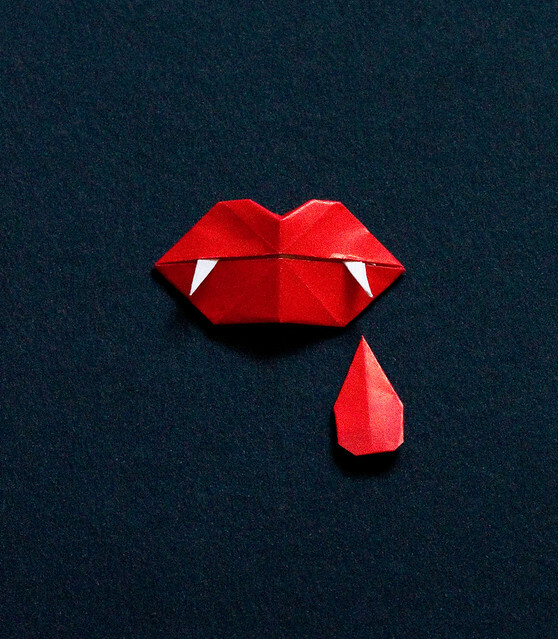 I came across this vampire fang model in an origami book I had as a kid and thought it would be a great, versatile decoration for Halloween. Glue it to toothpicks for cupcake toppers or use it to decorate a Halloween bar. They'd be great at a Twilight/True Blood/Vampire Diaries/Buffy/Lost Boys theme party! All you need is red origami paper! I used three sizes: 7 1/2", 5", and 3 1/4" square. With the white side of the paper up, crease diagonally both ways and unfold. Fold the corners to the center and crease. Fold the new corners to the center, crease and unfold. Fold the bottom and the top to the center line and unfold. Unfold the right and left flaps. Fold the bottom up to the center again. Fold the right flap upwards to meet the top corner. Lower the flap down and flatten. Repeat on the left side. Open the center flaps and fold the top downwards to the center. Lift the right pointed flap, open it out and press it down into a diamond shape. Repeat on the other side. Fold both edges towards the center of each diamond. Pinch the center of the white part, folding it together. 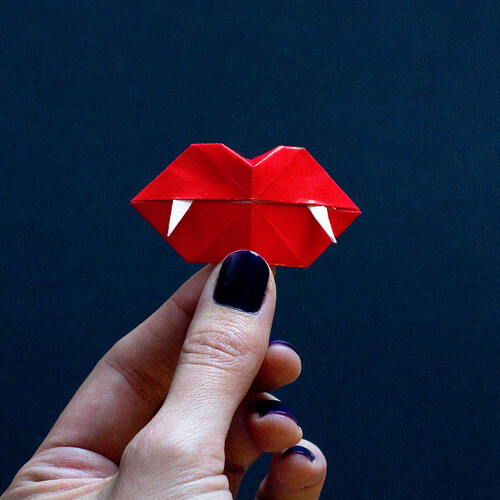 Hold the edges flat while folding it downward, making a fang. Repeat on the other side. Open the flaps and tuck the white parts inside, so only the fangs are visible. Fold the model in half and fold back the top point. Done! You can fold some blood drops, too! Just use 1" squares of red paper. Fold diagonally, white side up. Fold two edges to meet the center, then fold the side corners in and the top corner down. Flip over. Model adapted from Horrorgami by Steve and Megumi Biddle. 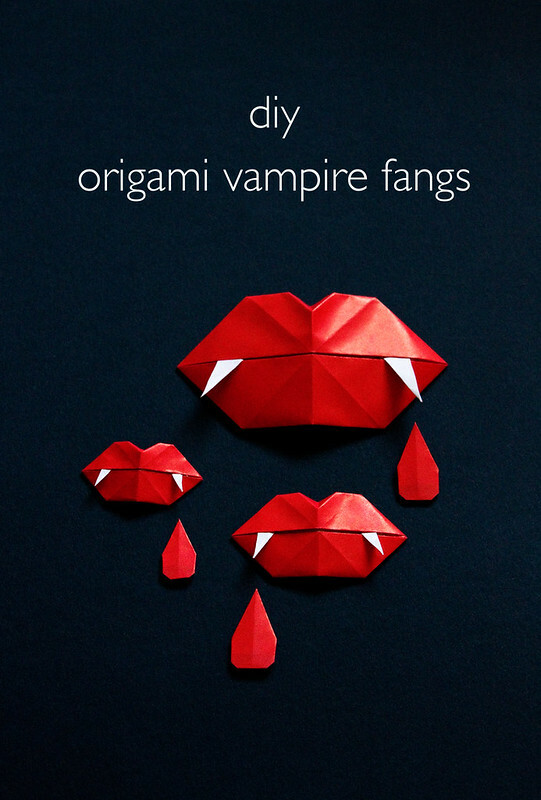 If you're looking for other fun Halloween projects to try, check out this roundup of Origami Bats! There's one for each skill level! These are great! Love the look of the paper too. love art paper, love this. Thank you Casey. too complicated on photos, could you do a video tutorial please?